New Year, same old endorsement tweets sent from the wrong phone. There have been many a time where celebrities tweet endorsing a mobile phone but the tweet is sent out with a different phone. What commonly happens is Celebs tweet endorsing phones other than the iPhone but then the tweet is sent out from an iPhone; which kinda defeats the whole purpose of an endorsement. 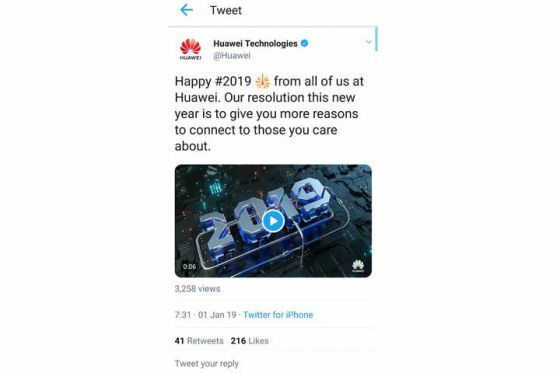 This has been going on for a couple of years now but Huawei has outdone themselves this time as a tweet sent out from Huawei’s official Twitter account carried the embarrassing “via Twitter for iPhone” badge which is quite weird. To people who are well versed with how marketing works this won’t necessarily be a big deal because those people will most probably understand that Huawei’s social media accounts are managed by agencies and not directly by Huawei. The mistake occurred when outsourced social media handler Sapient experienced “VPN problems” with a desktop computer so [it] used an iPhone with a roaming SIM card in order to send the message on time at midnight, Huawei said in the memo. When it’s big name celebs making this mistake they are usually just told to take the tweet down but in this case, demoted and cut the pay of two employees held responsible for the careless mistake. Apparently, both staffers got a single-level demotion and a salary cut of about US$700 per month. To ordinary consumers, it’s a bit baffling and it may even seem like an admission of the greatness of a rival when something like this happens. It comes across like Huawei can’t even be bothered to use their own products and though it’s just a blunder it sure does put Huawei in a bad light for people just looking. And on the fans side it’s a + for Apple fans when the ever-raging debates of iPhone vs Android go on. I guess the Gal Gadot/MKBHD incident must have cost Huawei some serious ‘face’ for them to take such drastic measures this time. If it weren’t for the extenuating circumstances, these poor guys would have been out and out fired, but I think a strong reprimand would have been more appropriate.